Scooper - Technology News: We need creativity to survive. So why are we so suspicious of it? Vomit. Poison. Agony. These are among the words participants used to describe their feelings in two 2010 University of Pennsylvania experiments . Researchers measured more than 200 peoples’ reactions to creative proposals for dealing with stubborn problems. They overwhelmingly found that rather than embracing these potential solutions, participants reported strong negative reactions. Researchers concluded that the drive of participants to reduce the very uncertainty upon which creative ideas appear to thrive resulted in feelings of potential failure and social rejection – hence the reactions. Sadly, not only are creative ideas dismissed, but the people who come up with them are less likely to be promoted, recognized as leaders, or deemed to be reliable teammates. The paradox of this bias against creativity lies in the fact that creativity – along with its close cousin innovation – is frequently celebrated in business as a most desired organizational trait. Reports of management excellence from McKinsey to KPMG state that creativity among the workforce is a basic requirement for long-term business success. Why then does the organizational immune system kick into high gear whenever exposed to the very thing it needs to survive? As a lifelong product maker and trafficker in all things creative, I was struck by the routine rejection of creativity described in these studies. I rationalized that corporations would certainly be the most obvious places where creativity would wither (admittedly, not very generous or creative thinking). The sheer burden of managing uncertainty leads to friction-reducing behaviours. It seems unfortunate but not unexpected that corporate leaders cry for creativity, while the calculus employees make favours practicality over novelty. I wondered if the same was true in non-corporate environments. In elementary schools, teachers rate creativity as a highly regarded quality, yet they overwhelmingly favour their “satisfier” students, and actually discriminate against students who exhibit creativity. Disturbing, but perhaps a survival tactic for overstretched teachers in under-supported schools. Are you disturbed by the findings from the bias against creativity studies? Have you found yourself at [insert mega-mythic innovation company] exhibiting similar behaviour? 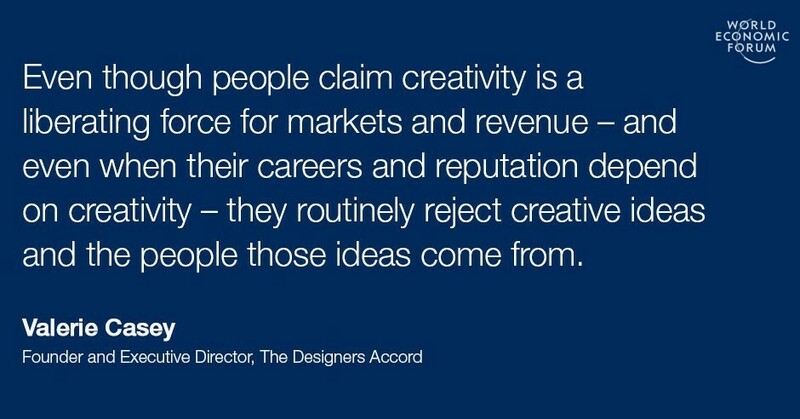 Even though people claim creativity is a liberating force for markets and revenue – and even when their careers and reputation depend on creativity – they routinely reject creative ideas and the people those ideas come from. Education guru and TED-charmer Sir Ken Robinson describes creativity as “the process of having original ideas that have value.” How did the value piece get separated from the creative? Starting in the mid-2000s, innovation consultancies went from using design methodology to create toothbrushes and teapots, to using it to build cities and systems. In doing so, they heavily promoted their methods as a business panacea. While I was an executive at innovation leaders frog design and IDEO, I hugely favoured this democratization of design thinking and advocated for its broadest adoption – who wouldn’t support applying this thoughtful methodology built around empathy and rapid iteration to our most intractable challenges? I was stopped in my tracks when a healthcare client showed me a laser-printed certificate of completion from an online 3-hour Design Thinking course. “Now I’m creative!” she crowed. Sigh. With the rapid popularization of “designing” business, we had built a frothy cottage industry around the romance of creativity and mystique of innovation with none of the accountability, rigour and – to be honest – sweat that comes from making products. Our experiment in teaching creativity from the playbook of reverse-engineered success stories had led to a decoupling of creativity from actually solving problems. Faced with colossal human, economic and environmental challenges, we need ideas that reach far and disrupt the status quo. We need to recast creativity into an engine of impact, not a source of distraction. In my work with governments and organizations in tech, health and education, I’ve seen the following strategies ensure that creativity’s value is recognized as a critical, competitive problem-solving tool in businesses, schools and communities. Here’s how. Creating is not the last mile in creativity – it’s the last 25 miles in the marathon. Without building, iterating and reflecting, the process of creativity – and all its powerful yield – evaporates. There is value in creating tangible, actionable outcomes because they concretize our opinions and experiences. Simple prototypes make ideas visible, and observing a user’s reaction to that prototype incredibly persuasive. “Encourage wild ideas” is a favoured battle cry in brainstorming. It’s been interpreted as meaning that somewhat silly ideas are the most promising in this creative exercise. In reality, the purpose of this phrase is to signal to participants that the session is a safe, non-critical space for everyone to share ideas without judgement. Inviting “wild” ideas creates the space for a more thoughtful concept to emerge. Creativity studies posit that great ideas are built by making leaps in received logic, and by seeing connections that are not immediately obvious. These epiphanies are brilliant when you have them, but maddening when someone else does – often they simply don’t make sense at first blush. It’s incumbent on the author of an idea to bring people along and clearly articulate their thinking. It may not be easy at first, but the discipline only strengthens great concepts. The innovation business flogs the myth of the lone inventor, who toils away through the night to create game-changing ideas. The reality is that all great products, services and organizations are co-created by systems of people. The concept of authorship in creativity is a powerful one, but it needs to be treated more as a responsibility to bring an idea to fruition, not as a right to control. You can never own an idea, but you can cultivate it. Silicon Valley ill-advisedly celebrates the brow-beating joy of failure. I have found that discussions of failure mislead people into believing creativity is not connected to business intelligence. Also, failure doesn’t create insights, and insights don’t fuel next steps. Our stories instead need to tell of resilience – the ability to be flexible enough to transform observations into learning and then new opportunities. These mantras of healthy, effective creativity do work. They transform that fear of failure into practical, actionable approaches that meet challenges. We must stake a claim on creativity’s core pillars of critical thinking, making connections between disparate ideas, and resourcefulness in order to be able to conceive of and build meaningful solutions to the problems that lie before us.